STRAC is the recipient of a $150,000 grant from the San Antonio Medical Foundation. 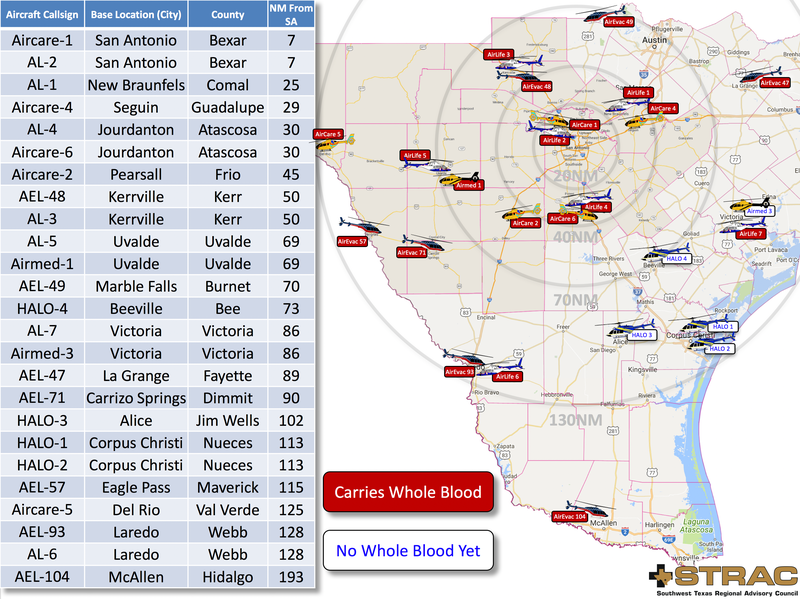 This inter-institutional collaboration with the South Texas Blood and Tissue Center, UT Health San Antonio, University Health Systems (UHS), and the US Army Institute of Surgical Research / San Antonio Military Medical Center was formed to study and address the deficit in the care of injured patients in STRAC region through the development of a cold stored whole blood product and implement transfusion of cold stored whole blood in the prehospital setting on emergency helicopters. What is cold stored whole blood? Low anti-body titer cold stored O+ whole blood is an FDA licensed and AABB approved blood product for administration in emergency release situations when other blood products are unavailable and/or the patient’s blood type is unknown. It is the unit of blood drawn from the donor which has been tested like any other blood product and a preservative is added (just like any other blood product) so it contains the red cells, plasma, platelets and white cells from the donor just like it was when it was circulating in their veins. Why do we need whole blood? Our study of our patients indicate that waiting until a patient gets to the hospital to give the first transfusion has a very high death rate (over 70%). Cold stored whole blood can safely provide oxygen carrying capacity and restore coagulation at the same time. Are there any concerns about whole blood? No. This was the only blood product available from the inception of blood transfusion into the 1970’s. Patient transfusion risks actually decrease since they are receiving a transfusion from one donor source instead of three. How much volume is in one unit of whole blood? Each bag contains roughly 520 cc of total volume. Equivalent to 1 unit of PRBCs and 1 FFP. How is it different than PRBC’s? Cold stored whole blood contains plasma and platelets. Why use this and not 1:1:1 with components? Logistics. The effective shelf life of platelets, the number one coagulation factor needed by bleeding trauma patients, is three days. Patients bleed whole blood; we replace it with whole blood. No. It is also not leukocyte reduced. Yes, it should be. It can be used through all FDA approved warming/infusion devices. Yes. Platelet function in cold stored whole blood on day 35 is the same as platelet function in a regular unit on day 5 when it must be used or discarded. Is this universal donor blood? Can this be given to women of childbearing age? Yes. The risk benefit to the patient favors risk of antibody formation versus death due to hemorrhage. If a woman of childbearing age has Rh- blood type, should they receive RhIg (RhoGAM)? You should consult with your transfusion medicine and/or obstetrics expert. What about use in children? Children under the age of three probably should not get emergency release whole blood due to the development of their immune system. What kind of reactions can occur? The same kind of reactions that can occur during transfusion of any blood product. Does this interfere with the administration of other, additional blood products or medications? No. Administration is the same as with all other blood/blood products. Will transfusion of O+ whole blood impact a patient’s blood type? In small quantities, no. However, just as with any uncrossmatched, emergency release blood product, this issue can arise if the patient gets replacement of their full blood volume. It is typically not a life threatening condition. Can a patient receive component therapy after receiving O+ whole blood? Pre-hospital Low Titer Cold Stored Whole Blood: Philosophy for Ubiquitous Utilization of O Positive Product for Emergency Use in Hemorrhage due to Injury. The South Texas Blood and Tissue Center on January 29, 2018 launched the "Brothers In Arms" blood donor program.